The first two races of the 2011 Formula 1 season took on a very predictable tone as 2010 World Champion driver Sebastian Vettel claiming victories in dominant fashion in the Australian and Chinese Grand Prix. Planting Red Bull Racing in an affirmative position, Vettel took his Renault powered Formula 1 car to a third consecutive pole for the Chinese Grand Prix. However, for those who have grown used to Formula 1 lacking raw, on-track competition, the 2011 Chinese Grand Prix was an event that suspended all garden variety notions of the world championship of open wheel racing. Setting the grid for the start of the grand prix, the Red Bull-Renault of Sebastian Vettel was beside the McLaren-Mercedes of Jenson Button and ahead of Lewis Hamilton's McLaren. 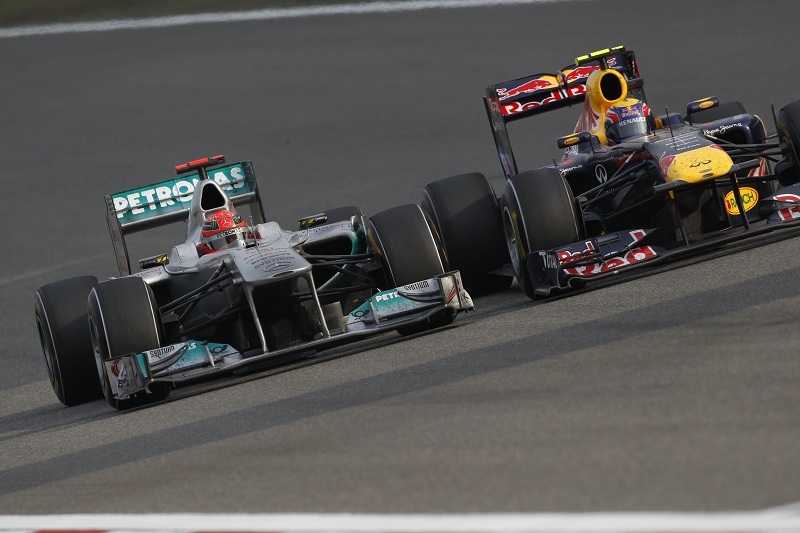 Favoured in his 2011 title defense drive, the Chinese Grand Prix standing start changed the complex of this season. Though Vettel launched well off the line, both McLaren Formula 1 race cars rocketed past the Red Bull-Renault into the first corner. Shuffled back to third early in the Shanghai race, Vettel entered into an unfamiliar place for this season. With Jenson Button leading, the McLaren-Mercedes preceded at the front of the Chinese Grand Prix as concerns existed in durability of the Pirelli racing tires. Featuring two tread options, most drivers and teams chose the softer set of tires for racing. One notable exception early was Vettel's Red Bull Racing teammate Mark Webber who started on harder racing slicks in efforts to seek a solution in overcoming a disastrous qualifying attempt Saturday which nested an 18th place grid position. Perhaps planning to gain track position through potentially running longer on his Pirelli tires, Webber's work in advancing places on the racetrack was hindered by the slower, harder compound. Ultimately, Mark Webber would pit on the same strategy with the other front-running teams negating early race plan for more competitive, softer compound Pirelli tires. The pit road would ultimately shake up the 2011 Chinese Grand Prix. In the case of early race leader Jenson Button, the first pit stop on lap 13 for the 2009 Formula 1 World Champion involved a most bizarre moment in the driver's career. Taxiing down pit road, Button mistakenly steered into the Red Bull Racing team pit stall. Awaiting Sebastian Vettel, the bewildered Red Bull Racing crew were eager to see the McLaren promptly leave the pit service area. Barely stopping, Jenson Button quickly noticed his error continuing on to his McLaren pit crew. Due to the graffe, Button did lose track position to Vettel placing the Red Bull-Renault one place higher in the race standings. As front-running drivers Lewis Hamilton, Jenson Button and Sebastian Vettel surrendered their position for pit stops, the Mercedes GP team emerged as a Chinese Grand Prix contender. In the hands of Nico Rosberg, the German driver and race organization mastered short-pitting to place themselves in the lead for 8 laps. After a tough first two races in the 2011 Formula 1 season, the showing for Mercedes GP in China reestablishes the momentum the team started their inaugural 2010 season. Nico Rosberg would remain at the front through the reminder of the grand prix but lost positions running on worn tires in the late race stages. The Mercedes GP team chanced a different pit road plan to vault the German up to 2rd place until the faster cars of McLaren and Red Bull Racing overhauled Nico Rosberg. Rosberg would just miss the podium but finish a season best 5th at the Chinese Grand Prix. Scuderia Ferrari also gambled on a two-pit stop race strategy for track position. The success was mixed during the 56-lap distance as Fernando Alonso and Felipe Massa finished 6th as well as 7th place. The longer late stint also proved costly to the Ferrari team as they rode in higher positions just ahead of the checkered flag. As part of the story in the closing stages of the Chinese Grand Prix focused on the slowing of some vehicles, the McLaren-Mercedes piloted by Lewis Hamilton was on a mission to the front lapping the Shanghai track. Sitting in 4th place on lap 40, Hamilton utilized his fresher tires, KERBS and adjustable rear wing system to pass Rosberg and Massa in only 4 laps setting sights on the leading Red Bull-Renault. Eating into the modest lead of just under 4 seconds, Lewis Hamilton's superior lap times put the silver McLaren right on the gearbox of Sebastian Vettel. On lap 52, Hamilton brief attempt at working over Vettel for the lead paid off in turn seven ending off a thrilling climb to the front. As Hamilton led the final 4 laps of the Chinese Grand Prix, the 2008 World Champion pulled a 5.1 second lead on the second place Sebastian Vettel. Though disappointed by his attempt at a fifth straight Formula 1 season victory going back to last season's Brazilian Grand Prix being foil, Vettel and Red Bull Racing maintains an ongoing streak of podium finishes. Sebastian Vettel could also take relief with the arrival of the lap 56 checkered as his hard-charging teammate was closing distance. Starting 18th, Webber's strategy adjustment allowed the second Red Bull Racing car to surge through the field at an alarming rate. Clocked as one of the fastest cars on the racetrack, Mark Webber's three-stop plan allowed the Australian to maneuver himself to the front. With some Formula 1 observers noting Webber's results as considerably lackluster compared to his dominating teammate, the 2011 Chinese Grand Prix establishes again the strength of both Red Bull Racing cars. Rolling out the top-10 behind the Nico Rosberg and the Ferrari Formula 1 cars, Michael Schumacher continues to challenge fellow drivers on-track with skills that only a 7-time World Champion would possess. Finishing 8th, Schumacher was more than 26 seconds in front of Lotus Renault Racing's Vitaly Petrov and 10th place Kamui Kobayashi. As Sebastian Vettel's early season showing and Mark Webber's drive in China reflects, the Red Bull Racing team is shown as a formidable squad again in 2011. However, McLaren F1 is proving to be an early challenger having at least one car on the podium at the end of grand prix this season. After three races in the 2011 Formula 1 season, Vettel is 21 points ahead of Lewis Hamilton. Next race for the Formula 1 tour will ake place on May 8th as drivers and teams are given a long preparation for the Turkish Grand Prix.